Ulvesund Fyr is located at Hjertenes by Måløy, in the municipality of Vågsøy, in Nordfjord. The lighthouse was built in September 1870. 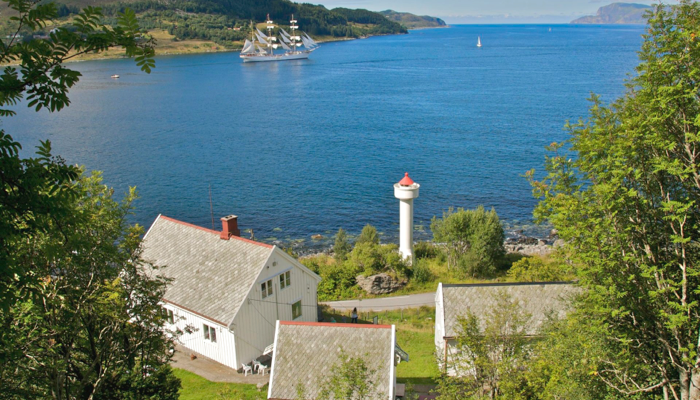 It is one out of four lighthouses that guide ships safely around Stadt, one of the worst sea passages in Norway. The three buildings belonging to the lighthouse property are encircled by a sunny garden with an abundance of flowers and berries. Here, our guests have a panoramic view of the sea traffic and can enjoy the changing light from Sildagapet, as well as stunning and serene sunsets. In the charming lighthouse shop, our guests can buy homemade cordials, preserves, handcrafts, music, books, glass, coffee, tea, chocolate and confectionary. We serve fresh coffee and a varied menu of homemade food in our lighthouse cafe, or out in the garden. We provide accommodation on the top floor, in the ”Outhouse” and in the “Maskinhus” (machine room). In the lighthouse garden, guests can enjoy a swing and a hammock with an ocean view, two sociable goats and an idyllic view. We also have paints for hire for inspired visitors. Lighthouse Cafe We serve homemade food and Saft from the berries out of the garden. Accommodation Where guests fall asleep to the sound of waves, and wake up to birds singing.